2014 was definitely the year of the monthly subscription box. There were beauty boxes, food boxes, boxes of treats for your pet and even a box for that time of the month. You name it! Whatever your fancy chances are there is a subscription box out there for you. Last year I subscribed to four different beauty boxes (not all at once I hasten to add!) and towards the end of the year I began to feel a bit swamped by samples, many of which were of the same product. I’ve actually settled into a regular skincare routine and I don’t really feel the need to switch up my products as much as I used to so I’ve cancelled my remaining subscriptions. I still wanted to have that feeling of having something that’s just for me though. Something to remind me that I’m not just someone’s wife and someone’s mum. I have always had a bit of an obsession with stationery. When I was a teenager my favourite time of the year was the final week of the summer holidays. That week was always spent shopping for lovely new notepads, pens and folders for school. Even now I get a bit giddy in stationery shops. Back when we were first engaged Hubs joked that we should spend our honeymoon in Staples. It’s been a lifelong love affair so when I was thinking about the kind of subscription box I’d like to try next stationery was an obvious choice. 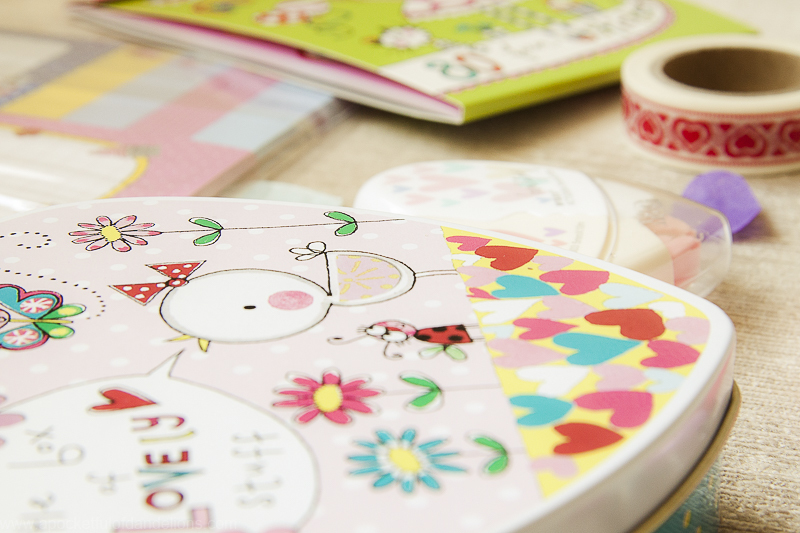 As it happens there aren’t very many stationery subscription boxes here in the UK. There are loads in the US that ship to the UK but the cost of P&P plus potential customs charges put them well out of my price range. Of the UK based ones I could find most of them include items that I have no use for such as notelets and cards. Then I happened upon a review of the Brimbles Box on the Hey Charlie blog and it looked like exactly what I was after. What makes the Brimbles Box so great is that you can either take out a monthly subscription for £15 a month or purchase a single box at a one-off cost of £18 plus P&P. I went for the single box option so that I could try it out before considering a monthly subscription. The February box arrived at the beginning of the week. It was nicely packaged in a sturdy box and the contents were nestled in pink shredded tissue paper with tissue paper hearts sprinkled in it. The theme for the month is Love, for obvious reasons, and I think the contents match the theme perfectly. By my reckoning the total cost of the contents comes to £21.84 which is a little bit more than the cost of a single box plus shipping. You can’t get any fairer than that really. Of course it’s a better deal if you go for the monthly subscription. I really love everything I received. The tin will be used to store all of my loose embellishments and I’ve already put the pen, paperclips and washi tape to use in decorating next week’s pages in my planner. I guess the big question is will I be taking out a monthly subscription? The answer is, maybe. I think I’ll buy another one-off box, the March box, just to see if the contents are as good as February’s are. I really hope they will be! Want more? Read my reviews of the March Brimbles Box and the April Brimbles Box. Oh that’s so lovely – must not click must not click – I love stationery, it makes all sorts of boring tasks so much more fun!! Please will you share the contents of the March box too if you get it?! This box looks amazing, I love the macaron erasers. I might have to make a sneaky purchase..
They’re so dinky and adorable. I used to collect novelty erasers when I was a teen (sad I know) so they really appealed to me.